So I don't want to dwell on the fact that I'm a little anxious about PARCC. Not because I don't think our kids will do amazing - because they will, but really for just fear of the unknown. First time administering this online, first time for it all. Plus I've had conflicts with lots of the sessions that were meant to prep us for tomorrow, so I'm just kinda beating myself up a little bit. Thankfully my work soulmate is amazing and always fills me in for everything - she is a true lifesaver! Anyways, back to the point of the anxiety - and how then I got the best email from a colleague. 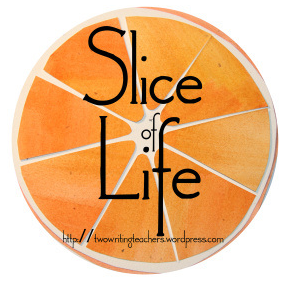 It's actually from a fellow blogging friend, JennieB and her coteacher Jill Pickle. They've got their third graders writing fairy tales right now and she shared one of them with me. It totally brought me back down to Earth. This kiddo wrote the best fairy tale based on The Three Little Pigs, except it's three horses and a mountain lion who wants to eat them. Her vocabulary is awesome, there's dialog to boot, and the use of meanwhile as a transition word has got me singing to the writing Gods and Goddesses. Plus the horses love pumpkin donut holes - I mean, who doesn't? Reading this piece, in the midst of all the PARCC anxiety reminded me of my purpose here - to inspire children to be real life readers. Real writers. Kids who do math to solve real-world problems. Kids who have interests in the content areas. And, kids who are prepared to show their best work on a type of reading and writing assessment that is a fact of life, even when it's authenticity is questionable. So thank you to Jennie and Jill, and thank you kiddo CS - your fairy tale rocks and was just what I needed to read right at this moment! Michelle - you're so honest in this post. Your honest concern about PARCC testing - reflects the fears that all of us feel when implementing our state mandated testing systems. We all believe in kids - but sometimes the pressure feels very intense. Thank goodness for the opportunity to connect with kids - they remind us why we come every day. It is not test scores! Thank you for sharing. Now THAT is some great creative writing! I want to work for an administration that says, "I don't care what those tests say... I KNOW your kids are learning!" I'd rather prepare my kids to be lifelong readers, writers, and problem solvers than worry about preparing them for some STUPID test. You'll do just fine tomorrow; you're a rockstar!! It is so hard to keep the good stuff in perspective when the testing is so looming and just scary. But these little reminders are good for all of us out there! Thank you! !